Every so often I return to Priacta’s interactive GTD software comparison table, which rates and lets you compare more than 160 productivity apps that are compatible with David Allen’s Getting Things Done (GTD®) approach. What made me notice get it done was the high score for GTD–compatibilty (6/10) it received from Priacta, placing this browser–based to do app almost on an equal footing with feature–rich ToodleDo. My interest piqued, I decided to check out the free 15–day trial version and share my findings with you. Get it done (GID) has a colourful, well–designed user interface. The app is easy to learn and the GID website provide extensive documentation, should you need help. The GID setup will be familiar to anyone using GTD: inbox, today, next, scheduled and someday views, followed by a list of projects. Contexts can be created using tags. Tasks can be created by clicking on a ‘quick add’ or an ‘add task’ button on the screen, or by forwarding emails to your inbox. 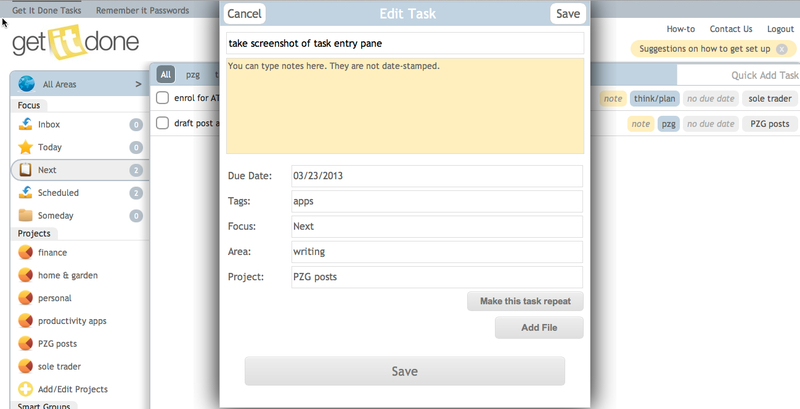 The screenshot below shows the detailed task entry screen. It was pleasing to see that GID (like Omnifocus and ToodleDo) lets you schedule repeating tasks from the point of completion as well as periodically (weekly, monthly…). 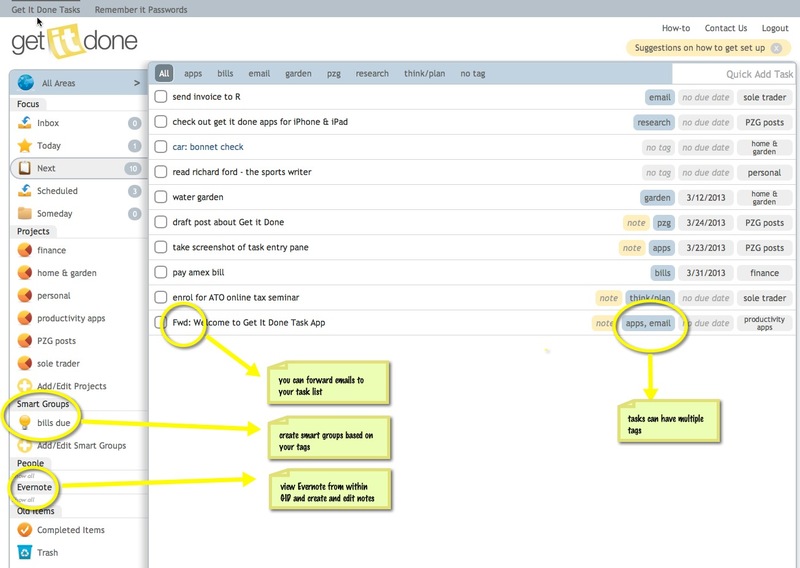 The screenshot below illustrates some of the best features of GID: Evernote integration, the capacity to assign multiple tags to a task and to create smart groups based on tags. You can create an @supervisor or @coworker tag and the smart group of that name will give you a ready–made list of items to discuss with your manager or colleague. An @waiting tag will give you an overview of outstanding issues; and an @15min tag will provide you with a smart group showing tasks that can be completed in the gaps between your meetings. Go to ‘settings’ to activate Evernote integration; a tab will appear in the navigation pane on the left that lets you view, edit and create notes in Evernote. This is pretty impressive — I can only think of three other apps that offer full integration with Evernote at present (zendone, IQTELL and nozbe—all three reviewed elsewhere on this blog; see search box). The app supports team collaboration, but only with other paid–up GID users. free mobile apps for iPhone, iPad and Android. I found screen loading times slow, even with only around 20 tasks entered. The full version of get it done costs $39 per year. This is much cheaper than nozbe and comparable to other browser–based GTD® apps such as Nirvana and Doit. In my view, Doit, which I will review next, presents better value for money ($20 p.a.). It does have subtasks and allows you to set goals—but lacks the Evernote integration. Only you can decide which app best suits your preferences and workflow and I hope that this post has helped to convey that get it done is a respectable contender—an attractive app built around a solid GTD® approach. Have you used get it done? I’d be interested in your comments! This entry was posted in productivity and tagged email integration, evernote integration, get it done, GTD, productivity, to do app by Gilbert Van Hoeydonck. Bookmark the permalink.